The CBI today failed to produce in Calcutta High Court a photocopy of the case diary in the Madan Tamang murder case saying the Xerox machine at the agency's Salt Lake office was out of order, prompting the judges to express surprise. "Is that so? This court had ordered the investigating agency to produce the photocopy of the case diary two weeks ago. The photocopy machine of such an important agency has been out of order for so many days? Why did the agency not try to make photocopies from another place?" asked Justice Ashim Kumar Roy, the senior judge on the division bench. The bench of Justices Roy and M.M. 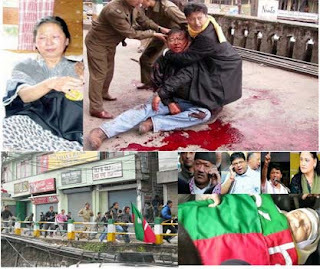 Banerjee was hearing the anticipatory bail prayers of Gorkha Janmukti Morcha president Bimal Gurung, who recently met Mamata Banerjee and visited Delhi, and 22 other leaders and workers of the hill party in the murder case of ABGL leader Tamang. They have been named in the CBI chargesheet. Advocate Ashraf Ali, the counsel representing the CBI, told the court that the agency did not make photocopies from outside the office to maintain secrecy of the documents. "Then do one thing. Produce the original case diary in court tomorrow. We will make photocopies of the relevant pages in the high court. Before hearing the prayers made by the petitioners, we want to see the case diary," Justice Roy said. The CBI lawyer then requested the court to adjourn the case as his client wanted to engage a senior lawyer from Delhi. Justice Roy said: "If your client wants to engage a senior lawyer, then we have nothing to say. But you will have to produce the original case diary before this court at 2pm tomorrow." CBI sources said the agency had no other alternative but to try and buy time since the legal cell at its headquarters in Delhi was keen on engaging a senior lawyer instead of the Calcutta-empanelled ones representing it. CBI officers said the agency's office in Salt Lake's CGO Complex had only one photocopier and it was lying defunct for a few days. "A case diary is at least 500 pages. And it's not just the diary. You need to submit other documents along with it in court," an officer said. "We couldn't risk getting the documents photocopied from outside." In response to an earlier order of the bench, the CBI today produced a copy of the comprehensive report on its investigation into the Tamang murder case. The agency had earlier submitted the document to the Supreme Court. In the report, the CBI had filed a copy of the final chargesheet, which it submitted to Bankshall Court in Calcutta. After going through the comprehensive report, Justice Roy asked the CBI lawyer: "In your chargesheet, you have prayed before the trial court to summon the accused persons under non-bailable charges. At the time of summoning the accused, how can you say whether the accused should be called under bailable or non-bailable sections? It is the discretion of the court whether it would issue arrest warrants against the accused or not." The CBI counsel said a reply would be furnished during later hearings.